All sorts of pulleys in a whole lump of colours! The very first of these pulleys had four separate spokes, rather like an enlarged version of the 2" pulley. You can see an example at the top left of this photograph. For a while the part was one of the few with a larger ½'' boss (as kept on the 3'' sprocket and 6'' pulley), but that was replaced with a standard 3/8'' boss in 1928. As you can see from this photo though, the part has been through many colour combinations, including several reds and a couple of blues. Medium-wide. From the very first (spoked) pulley right through to 1928, the pulleys were all a medium width, around 9/32'' or 7mm (centre of picture). Medium. For a short time around the late 20's they narrowed slightly to 1/4'', just over 6mm. Wide. After 1928, they got significantly and noticeably wider (as per the one one the left of this picture), 5/16'' or 8mm, until the war. Medium-narrow. Almost all post-war pulleys are much narrower, 7/32'' or about 5½mm (right of picture). Narrow. 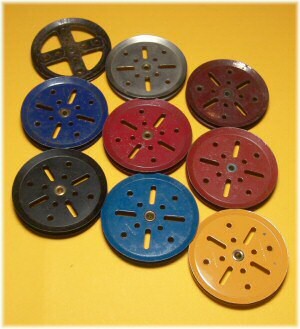 Some 70's pulleys are found even narrower, 3/16'' or about 4½mm. More information pending on these. Most 3'' pulleys have the standard brass 3/8'' boss. Some early nickel-plated pulleys were plated after adding the boss, so the boss is nickel-plated too. The earliest brass bosses are longer than the later (post-1930) ones. During the early 20's, however, they had a larger ½'' boss, also brass but occasionally overplated with nickel. During the start of the war, pulleys were also made for a short while with a 3/8'' boss made of Mazac (an alloy of zinc and aluminium). This dates from 1940/41 or perhaps even later. It will be seen that early pulleys were made from two different stampings, one has four rivets which pass through four holes on the other side of the pulley and hold the pair together. Stampings on these pulleys are often on only one side, and then the boss is added. From around 1928 or perhaps later, the pulleys are made from two identical stampings, each with two rivets passing through the other side. The markings on these pulleys are generally identical on both sides of the pulley. There are some difficulties here – the example of the 19b.re shown below is believed to be mid-30's by its width and colour, and yet is asymmetrical and so doesn't fit with the other examples. Earlier pulleys are in fact slightly less than 3'' overall diameter. They tend to be approximately 2 31/32'' (about 75mm). Later pulleys, from the 30's onwards are 3'' overall, just over 76mm. It may be that this variation coincides with the symmetry change above. In the "don't try this at home" department, Clive Weston has noticed that early red pulleys are found with both round central holes and slightly rounded square holes. This variation is presumably part of the developments in securing the boss of the larger circular parts, and the asymmetrical stampings would also tend to date these parts to the late 1920s. See the discussions on the central hole in the hub disc (part 118) and the boss changes to the sprocket wheels (part 95) for more related information. ¹ This very rare dark blue 19b is overpainted from dark yellow, including the boss, and found by Rob Mitchell. It appears to be genuine, and John Ozyer-Key agrees. Does anyone else have one of these we could confirm for sure? I'll venture into DBY territory again and claim to have a dark blue 19b. The shade and finish look right, a flaw in either immediately exposing a DIY job. A couple of scratches reveals the late 1970s yellow underneath and the boss is painted. It looks like this originally mustard yellow 19b, complete with boss, went down the dark blue paint line! Some 52s of the same vintage are known to have been similarly treated. According to a US market price list of January 1917, this part was initally numbered 19A and (it would appear) replaced the 3" spoked wheel which had occupied that number. Was this an aberration in the literature for that market or apparent in other the UK / other markets as well? I always associated Erector with meccano, I wasn't aware Gilbert bought up meccano USA. Gilbert bought the US Meccano Company, and made a number of items with the Meccano name. The Blue and Gold outfit on my home page is a Gilbert product - with the Meccano name. Thanks Kendrick, the picture does match my parts and explains the non standard thread. 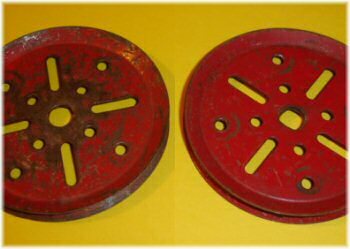 I am currently selling these two pulleys on ebay as I am not a Gilbert collector, (ebay listing no 280460135049 has a picture). I find it strange that Gilbert stamped their parts 'meccano' and not 'Gilbert' ! That sounds like a Gilbert Meccano part, made in the USA circa 1930 - 1933 or so. A picture is available at www.usmeccano.com - look under "parts".